To all my family, friends and readers, wherever you may be, here's wishing you all a very merry Christmas. 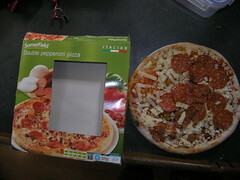 Look at the pepperoni on the pizza, then look at the window in the Somerfeld double pepperoni pizza box. Notice anything? I promise I did not move anything before taking the picture. I remember being similarly disappointed with one Somerfield's pizzas before. Things like this put me off shopping at Somerfield. 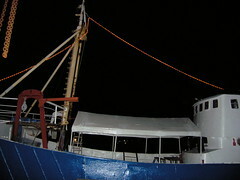 This wood cladding in the stern accommodation has so far exceeded my wildest expectations. I was originally going to use plywood for this part, but am so pleased I did not. Sadly, the photographs do not do it justice at all. The beautiful curving shape in all three directions just does not show up in the pictures. I took a few to try to portray the effect, but it's just not happening. This has truly been a team effort. Special thanks have to go to Andy, who toiled away until we were both completely exhausted. Now I have the first part done, I'm really motivated to get going and get the rest of the panelling up now. Once all the woodwork is done, and it's all sanded down silky smooth, I'll finish it off with a few coats of varnish. So I had a few friends drop by for a visit recently. 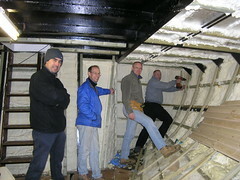 Seeing Rob, Steve, Andy and Lee again was a real pleasure, and an opportunity to utilise some willing hands to crack into a project which has been on my mind for some time - fitting the wooden 'skin' over the insulation down below. The two main reasons for choosing this particular project being the cold wind outside, and the chop saw I had just bought as a Christmas present to myself. Not surprisingly, none of us had any experience with a project of this nature, so after much discussion and planning we settled into it. With enthusiasm making up for any shortcomings in the knowledge department. As it turned out, the only real difficulty was deciding the lineup of the initial horizontal planks of wood. This was done using a combination of measuring and an 'eyeballing consensus'. 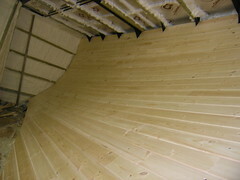 We had opted to start from the deckhead (ceiling) line down to the floor, as nothing else in there is really that straight anyway. A meal and a few beers down the pub later rounded off an excellent day. I'm extremely grateful for all the help. Thanks to Steve, Lee, Rob and Andy (in no particular order). So, with Fred's help, I got the Christmas lights up on Lady Jane. These are bigger, better, lights than last years. Last years lights did not really show up that well from a distance, these have so much more of an impact. The down side of the superior Christmas lights on the boat is that they drain so much more power, such that with the heating on as well I have to run the generator to keep things going. The original plan was to just leave them on, with a timer switch. Sadly with that much power drain it's not really practical. 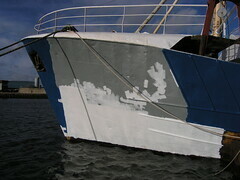 So that's it, the rust busting on the port bow completed - at least the bits I can get to. Here you see the bow with a first coat of primer down below, and that second coat of primer, the grey, up above. There is still a big patch to be done that's in the shadow of the crane barge, that will need to be done after Lady Jane is turned around again. Before I turn Lady Jane though, there is a small section of rust busting and painting to be done on the starboard stern and a tiny spot midships somewhere.